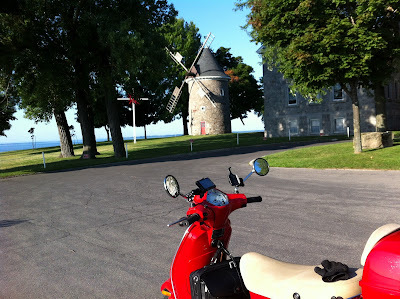 If you live on Montreal's west island, it's hard not to become aware of the Pointe Claire windmill. That's because it is part of the city's coat of arms. Here's a link to the city's website. It's equally true that unless you are both curious, and willing to go out of your way, you might never realize that there is an actual windmill. And unless you Google a little, you might never learn the history of the mill. The mill was built in 1710 and restored in the 1960's. There are only 18 left of the 250 windmills originally built in the province. You can find out more about three of them right here on this blog. See what you learn when you join the ranks of the scooter commuters? All it takes is a few minutes and a Vespa. You would think having living in Canada for 25 years and being completely educated in BC that I would know there were windmills in Quebec? But no, I don't remember that ever being mentioned in school. Thank you for the education - and cool windmill pics too. Thanks for this information and the photos of the mill. Really interesting info. This area is now on my Visit List. Trobairitz, hey I went to school here and we were never taught about mills or fortifications in Montreal, except perhaps fortified buildings in the old quarter of the city. 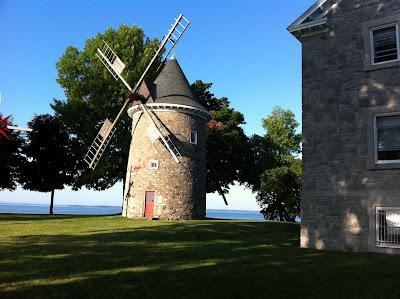 My next blog targets are another mill and a 17th century stone fort that are both within a 15 minute ride of my house, but that until very recently I didn't know existed. The fort was destroyed in a raid by Benedict Arnold, before he became synonymous for American treachery. Martha, Montreal and Quebec City are fairly unique in North America for having the earliest European settlements of any size. Both cities were the key jumping off places for the much of the exploration of the continent. Well worth a visit.